It is official. Auckland’s city rail link is under way. I attended the launch. Whoever designed it should take a bow. The launch was snazzy and future focused. The organizers made an inspired decision and invited a young Westie woman to be MC. Clearly her generation has the most to gain from a world class transportation system. Shaving 20 minutes off a downtown train trip from out west and doubling the system’s capacity are things any administration should aspire to. The politics as always was interesting. 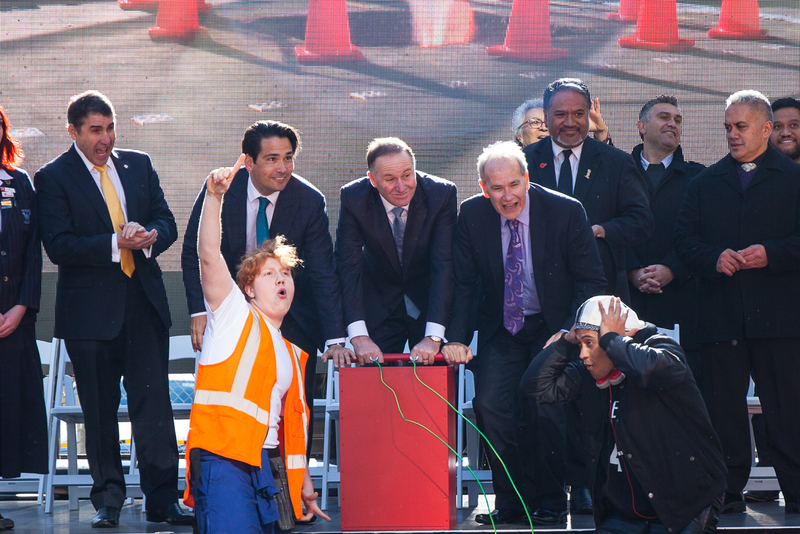 John Key, Simon Bridges and Len Brown all spoke. Key looked rather uncomfortable. National’s traditional reluctance to support trains was clearly showing. But he did manage to praise Len and Auckland Council for their support for the CRL. And the Government decision decision should be congratulated. But it is a shame that it took them so long to agree to do so. Len Brown spoke. He seemed to wipe away a tear as he started to speak. He was very gracious in what he said and thanked the Government. He highlighted the history of the concept and mentioned that back in 1923 then Labour Prime Minister Gordon Coates proposed the idea. Political history nerd that I am I noticed that he was off in his timing and his description of Coates but the gist was clear. He also mentioned how Sir Dove Myer Robinson was within an ace of achieving his goal of a rapid transport system back in 1975. The CRL is clearly an idea whose implementation is overdue. Then in keeping with the occasion a predominantly young flash mob appeared. Most ages were represented however. And for the coup de grace a large red box with a handle appeared. The handle was pushed into the box and then there was a mini explosion and suddenly we had the beginning of the CRL. The event must have been a bitter sweet one for Len as he approaches the end of his term. His primary policy goal, the construction of the CRL, is now under way despite the initial opposition and subsequent indifference of the Government. To be frank it is a shame it has taken so long. The system will be at capacity in a few short years before the CRL has been completed. But in years to come when people catch the train into Auckland they can remember the work of an Auckland Mayor who loved people and enjoyed dancing and worked tirelessly for the improvement of the city. Len could have been a good mayor, pity he buggered up his chance.